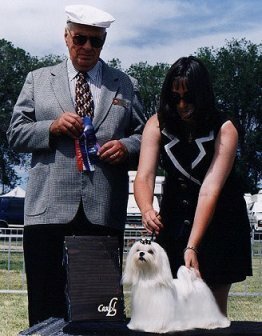 CH Ta-Jon's Bit of Rhapsody ROM"Rhapsody"
Rhapsody, bred by Tammy and John Simon of Ta-Jon Maltese, is shown above winning a major. She has a pretty head with an ice white coat and jet black pigment. She is a 6 pound girl with an elegant outline. She finished her title quickly with 4 majors and a Group 4 from the classes. I am happy to have this niece of CH Ta-Jon's Tickle Me Silly "Silly",the #1 maltese in the country for the the last three years.